JESUS CHRIST thunders to those of us — living in the end time, "Watch ye therefore, and pray always, that ye may be accounted worthy to escape all these things that shall come to pass, and to stand before the Son of man" (Luke 21:36). But how do you watch? What do you watch? And why is it important anyway? Nationwide surveys indicate that some residents of the U. S. don't even know who the Vice-president is! Millions are ignorant of who their own elected representatives are — let alone leaders of other important nations around the world. Millions are oblivious to major trouble spots, important capitals, a d strategic locations in the world. You can't afford to be that uninformed! The Apostle Paul set an example for us when he appeared before King Agrippa: "I think myself happy, king Agrippa, because I shall answer for — myself this day before thee... especially because I know thee to be expert in all customs and questions which are among the Jews..." (Acts 26:2-3). Paul watched what was going on around him. He knew who the government leaders were and knew something about them. In writing to the Thessalonians, Paul foretold our day: "For when they shall say, Peace and safety; then sudden destruction cometh upon them..." (I Thes. 5:3). The only reason people say "peace and safety" is that they aren't watching — they don't know what to look for to see that there is no peace — that there is no safety! Paul continued, "But ye, brethren, are not in darkness, that that day should overtake you as a thief" (verse 4). You don't need to be caught by surprise as all the prophesied end-time events occur — if you are watching! Don't be deceived by what appears on the surface. That's exactly what those saying "peace and safety" are looking at — the surface. Look beyond the pretty facade to the real problems in your nation and in the world. Look at the overall concepts of the human way of life. See the greed and selfishness evident the world over and ask yourself, "Where will it all end if things continue unchanged?" Certainly, the grass is still green in most places. The birds still migrate. The supermarket shelves are still lined with food. The paycheck for most keeps coming every week. Governments continue to set up new commissions and appropriate more money to solve problems. But all this is on the surface — it can be changed virtually overnight! Realize that the Black Forest of Germany was just as green in the summer of 1939 as any other summer. The day of the stock market "crash" in 1929 dawned just as beautifully as any other day. The few who looked behind the normal veneer of those times could see deep trouble. Most did not. Watch the economic trends of the world! Whose balance of payments deficit is increasing? Which nations are pulling ahead industrially and economically? Who is asking whom not to demand gold to redeem currency? Whose people are working overtime without pay to produce more, and whose are complaining and "bellyaching," striking for more pay, fewer hours, and better benefits — and less production? Which nations are intimidating others economically? And how long can a nation throw its weight around economically before it begins to do so politically — and militarily? Watch the Middle East — know what's happening there. It is a crucial area in international power politics. Know the leaders of the nations involved. Watch what they are saying and doing! Be aware of what's happening to the United States and Great Britain — in comparison to ancient Rome and every other government that collapsed because of internal decay. What is happening to our moral fiber? How is the crime rate doing — the venereal disease rate? Are we solving our problems or only going deeper into the rut? Are we removing the cause or merely treating the effect? Are cities solving their financial problems? How? By heavier taxes? By turning to the state and federal governments? What happens when the federal government needs help? And READ THE BOOK! Study BIBLE PROPHECY! You don't need to be saying "peace and safety" when sudden destruction comes! You don't need to be in darkness that that day should overtake you as a thief. Read and know God's Word. Know what God said would happen in our day. Then watch what's going on around you. Listen to people. Read the newspapers and magazines, listen to radio and TV newscasts. 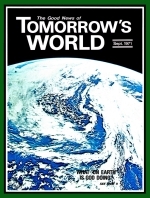 Continue to read TOMORROW'S WORLD and watch prophecy being fulfilled! Watch! And pray! — that you may be accounted worthy to escape!